German physicist who expanded on radio wave research by becoming the first person to send and receive them. By doing this he was able to prove the existence of electromagnetic waves. He intended to learn engineering, but found no interest in that pursuit. The unit of measurement of radio waves is named in his honor. 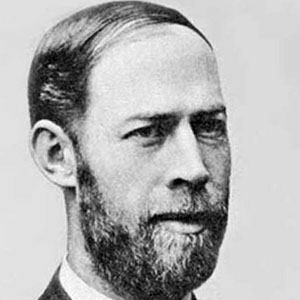 He married Elizabeth Doll, 1886 and their son, Carl Hellmuth Hertz, was a pioneer in the research of medical ultrasounds. Because of his Jewish ancestry, Adolf Hitler had his portrait removed from its place of honor in Hamburg's City Hall.